Vencore: The current solar cycle, #24, is the weakest solar cycle in more than a century and it is now heading towards the next solar minimum phase which would be the beginning of solar cycle #25. The last solar minimum phase lasted from 2007 to 2009 and it was historically weak. …… The current solar cycle is the 24th solar cycle since 1755 when extensive recording of solar sunspot activity began. Solar cycle 24 is currently on pace to be the weakest sunspot cycle with the fewest sunspots since cycle 14 peaked in February 1906. Solar cycle 24 continues a recent trend of weakening solar cycles which began with solar cycle 22 that peaked around 1990. In January this year, sunspot activity was declining sharply with the minimum expected around 2019/2010 (last minimum was in 2008/2009). SC24 maximum was reached in 2014 (the second of two peaks with the first in 2012). Whether we shall see the coming minimum (the Landscheidt Minimum) to be like the Dalton Minimum or a Grand Minimum like the Maunder Minimum remains to be seen. It should be clear by the time of the SC25 maximum around 2024/2025 and the next minimum in 2030. Landscheidt also predicted that after the next solar minimum in 2030 the following minimum would occur in 2200. 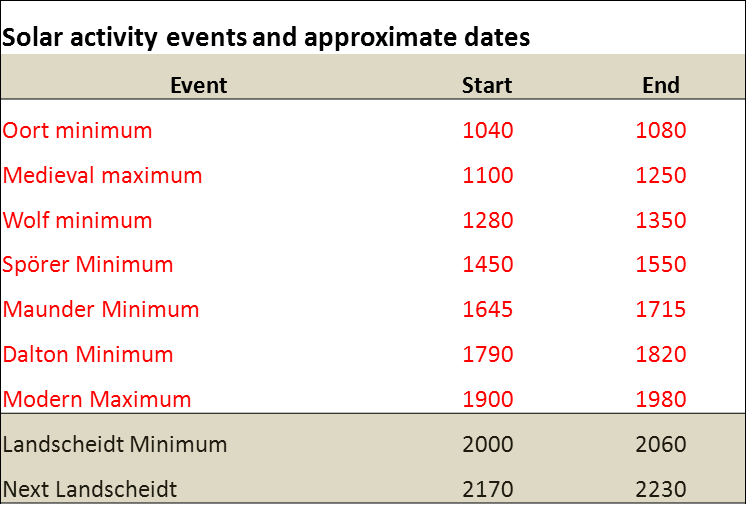 It is perhaps time to officially name this minimum that is coming as the “Landscheidt Minimum”. We are in for 3 decades of cooling. This entry was posted on September 4, 2016 at 7:09 am and is filed under Solar science. You can follow any responses to this entry through the RSS 2.0 feed. Both comments and pings are currently closed.